What: A “Rock n Roll P.I. Writer” who is also a fitness trainer, drummer and martial arts practitioner. Originally from Vancouver, B.C., he currently lives in Los Angeles and is working on books three and four in the Lou Crasher series. You have written two books in the Lou Crasher series, CRESCENDO and DRUMROLL PLEASE. What was your inspiration for this character? I’m often teased by family and friends that Lou Crasher is a Hollywood movie version of me. I categorically deny the accusation…kinda…sorta. I moved from Vancouver to L.A. in 1994 and attended music school. I went back in ’96 and toured Canada and U.S with a couple of bands. In 2000 I returned to L.A. and it’s been home to my wife and me ever since. Furthermore, I constantly kept an eye on Los Angeles headlines since I was about age 17 and always dug L.A. noir stories. I knew I wanted to do an amateur P.I. When I asked myself what/who is he, a reluctant, wisecracking, tough guy drummer tumbling into the P.I. biz just seemed to make sense. This entry was tagged #amreading, #amwriting, #interview, #selfpub, #Vancouver, Crescendo, drumming, Drumroll Please, drums, INdie publishing, Jonathan Brown, los angeles, Lou Crasher, self publishing. Bookmark the permalink. New Podcast Interview—Make It Big! My friend Paul Stinson has started a cool new podcast called Make It Big! It’s all about exploring the meaning of success in the arts. In my case, he was interested in how a one-time music career led me into writing mystery/crime fiction, and what the similarities are between the two. He and I spoke for an hour-and-a-half after my Noir Slam reading at The Last Bookstore in downtown LA a week ago. It’s a long interview, but he asks some great questions and it was good to catch up with him. The kind of conversation you’d expect two old friends to have over drinks, only with microphones. Make It Big! is still pretty new, but it’s a great concept. I can’t wait to see where he takes it. Stoked he let me be part of it. Enjoy! This entry was tagged #amwriting, #Q&A, #qanda, #writing, amercing, Down & Out Books, drummer, drums, interview, Make It Big!, music, Paul Stinson, podcast, Rare Bird Books, S.W. Lauden. Bookmark the permalink. Unless you play drums, chances are you don’t need to know much about where they are made, how they are made and who makes them. 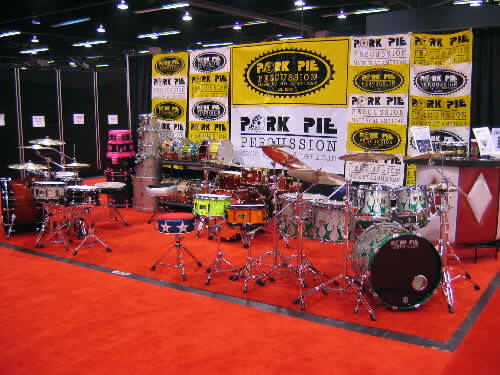 What music lovers should know is that one of the oldest custom drum companies in the U.S., Pork Pie Percussion, is located right here in Los Angeles, and they work with the drummers behind some of your favorite bands and musicians. That list includes Frank Ferrer (Guns N Roses), Butch Norton (Lucinda Williams), George Recili (Bob Dylan), Robin Diaz (Daughtry), Dave Klein (Agent Orange), and Marky Ramone (The Ramones). The following interview was conducted by email. Some responses have been edited. @LA_SMB: What was the inspiration for Pork Pie Percussion? 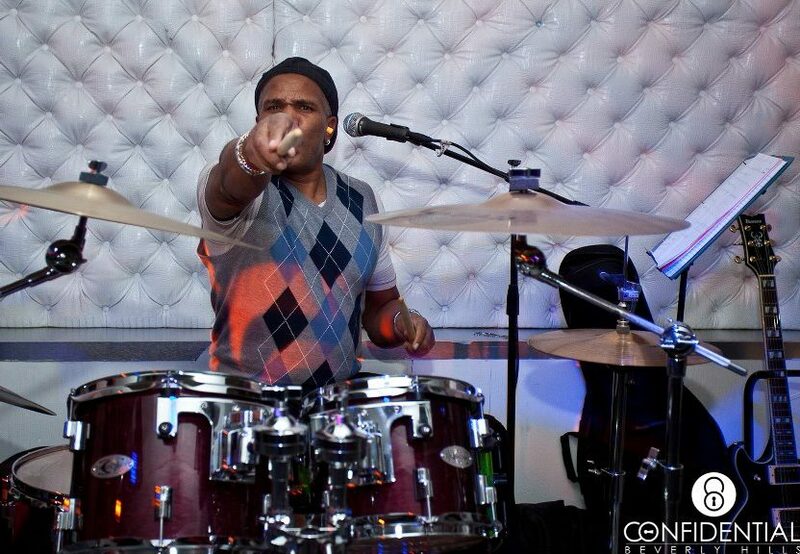 Bill Detamore: My inspiration started with playing drums and wanting to know how they work. I started buying old drums and customizing them for resale. I then bought a snare drum kit from a small company called The Corder Drum Company. I made that one, then bought 2, then 4 and so on. I put a serial number on every drum I make at my shop. I am now up to 45,000 drums. I love creating things and bringing new ideas to the market. This is all driven by passion. @LA_SMB: You still hand sign all of your drums. What are the advantages to remaining a boutique manufacturer? B.D. : Yes I still sign all of the drums made here at my shop. I take a lot of pride in that. Being a small drum manufacturer allows me to change things on a dime and also bring new drums out with no real problems. I can also make what I want and not really be concerned with what everyone else is doing. One thing I have never actually done is be to worried about what others are doing. I make what makes me happy. 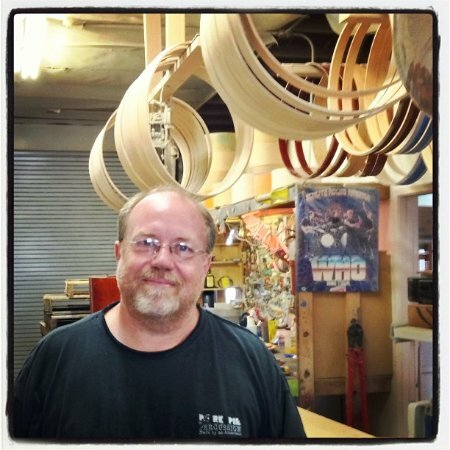 @LA_SMB: What are the limitations or advantages to making musical instruments these days? B.D. : The only limitation to making drums these days is a struggling economy. Business has been rough since 2007. @LA_SMB: How has the industry changed since you started Pork Pie? B.D. : The drum industry has been bombarded with imported drum sets, but I see that trend changing. Last NAMM (National Association of Music Merchants) show, earlier this year, many dealers said they were just tired of import crap and wanted to start focusing on quality again. B.D. : Being in LA is great because my biggest dealer, Guitar Center, is very close to my shop. I am able to make a new drum and take it to them to get business going with no real hassles. Studios being here is also great. I have studio musicians coming buy quite often to buy drums or use them for records, and also studios that have Pie kits for the house kit. @LA_SMB: Where will Pork Pie be in 5 years? B.D. : I will be here in my shop. I would like to grow the business to a pre-recession level and stay there. I have no ambition of taking over the world or becoming Ludwig or DW. Happy where I am right now. This entry was tagged business, California, drumming, drums, interview, LA, los angeles, music, percussion, recording. Bookmark the permalink. This story was originally published on GreenFriar.com. It’s not easy being a rock drummer around a campfire. This wonderful song book appeared a couple of years ago, handed down from a friend of a friend at a three-day motel party in Palm Desert. The chords-and-lyrics book had been printed, photocopied, and tabbed—pure magic in a three-ring binder from Staples. It has just about every grand, beloved and ridiculous song you could ever want to sing around a campfire, from “King of the Road” to “Don’t Stop Believing.” You haven’t truly lived until you’ve seen a drunken mom belting out Pat Benatar in the orange-yellow glow of a campfire, while her filthy children dance in the shadows. This songbook has become a mainstay of the many California camping trips my friends and all of our families enjoy in the mountains and on the beaches. Every camp night, just as the s’morefest is winding down, the guitars come out and everybody sings along. I’m the lone drummer in a sea of guitarists and singers. I’m not a percussionist, and certainly not one of those oh-I-also-play-seven-other-instruments-and-produce-recordssort of “drummers.” I’m just a plain old “1-2-3-4!” rock drummer. It has its place, but for most of my drumming life the campground wasn’t it. Over the years I’ve tried everything from banging rocks together to fashioning crude drum kits from various pots and beer cans—the stuff a frontier drummer might try. I even attempted clapping along, but clapping at a campfire hootenanny is right up there with trying to whistle a harmony: not cool, and not welcome. And then I discovered the secret: I started packing a simple egg shaker along with the rest of my camping gear. That changed everything. When the guitars come out now, I grab one of my camping shakers and deliver a simple backbeat. 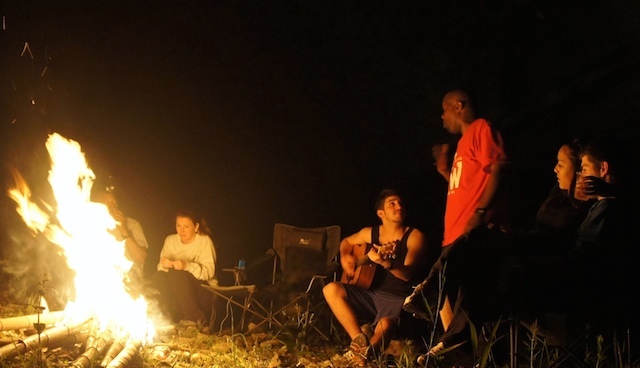 It provides the guitar players with the support so often necessary to get them to finish a song they hardly know, and it gives everybody else around the fire ring even more of a reason to dance under the stars. Most importantly, the kids love it. I’ve learned to bring an extra box of shakers, maracas and tambourines. Leave them on the assembled camping chairs and watch the insanity. The guitar players are guaranteed to have huge smiles on their faces, even as they struggle to play along with the cacophonous polyrhythm. Isn’t that what camping is supposed to be all about? Watch one of these videos for some quick shaker lessons. And while I cannot provide a copy of the Magic Song Book—the songs are not mine to give away—I can say that it’s easy enough to save your own lyrics-and-chords collection for private use. Song websites are everywhere, but Ultimate-Guitar.com is an established site that pays royalties to composers and publishers. Steve Coulter is a rock drummer who writes novels and runs media operations in his spare time. Campfire photo by David Leo Veksler. This entry was tagged California, camping, drumming, drums, LA, los angeles, music, shakers. Bookmark the permalink.